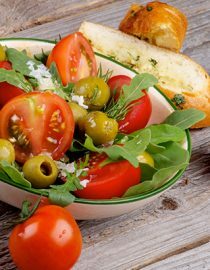 Health Benefits of Salad: Can Those With Bipolar Disorder Benefit From Salads? Can Those With Bipolar Disorder Benefit From Adding Salads? The answer to the question in the title is YES. I have seen this happen myself several times over the years. It’s no surprise that those with bipolar disorder have seen the added health benefits of salad; everyone who is human will benefit! Eating healthy salads is programmed into your physiology – and it’s something that you will even like doing. You’ll love how you feel after you eat a salad and you’ll notice your moods are more stable after eating a healthy salad meal. A healthy salad goes far to minimize triggers by stabilizing your blood sugar level, and since studies have shown that all the symptoms of mental disease are worsened with low blood sugar levels, you can only expect good results from eating more of them. A fruit of any type. Usually these work best: melons, apple, pear, peach, nectarine, strawberries, pineapple, coconut or blueberries. If you are trying to make the salad a meal, you’ll need to add protein to the healthy salad. Calculate about 4 ounces per person per meal. You’ll also need one of these: beans, rice, chickpeas or lentils to give you extra calories and longer sustaining energy. As an option, you could also add one type of nut such as almonds, sunflower seeds, macadamia nuts, pistachios, peanuts, or cashews. Walnuts also work well. You might also like...Bipolar and Childhood Trauma: What's the Link? Romaine lettuce, fresh mint, carrots, kale, celery, basil, strawberries, blueberries, beef strips seared in ginger sauce, lentils, and cashews. You could use your favorite dressing on top this salad or use a basic vinaigrette. Red leaf lettuce, parsley, fennel, cherry tomatoes, onions, hot peppers, bell pepper, savory, cantaloupe, chicken, almonds, and your favorite dressing.